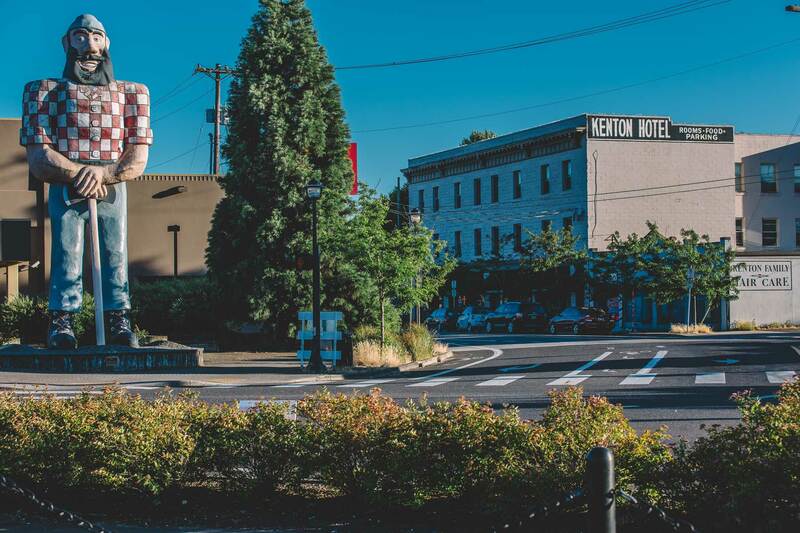 Kenton’s roots trace back to the late 1800’s when the area became home to Union Meat Company (later named Swift and Co). As a company town developed around Union, additional businesses flocked to Kenton making it the central livestock market in the Northwest. Today, the livestock is gone but the entrepreneurial spirit still remains and can be seen on a stroll down North Portland’s Denver Ave, the district’s 4 block main street. Kenton residents and business owners take pride in their historic district and Kenton’s iconic Paul Bunyan statue can be seen on everything from t-shirts to tote bags throughout the city. Venture Portland sat down with the leaders of the Kenton Business Association (KBA) to talk about what they love about the district and why they are proud to call Kenton home. Maureen (Mo) Bachman is President of KBA and owner of Kenton Antiques, a treasure trove of vintage and antique items offering consignment and estate sale services. Michelle Wood is a long-time KBA board member and Business Manager at Integrate Architecture, a residential and commercial architectural firm on the leading edge of contemporary design. What is your favorite thing about Kenton? Michelle: My favorite thing is the strong sense of community and the relationships between businesses and residents. Everyone is very supportive of one another. Kenton’s unique business mix isn’t found anywhere else in Portland. In addition to our restaurants, we have a number of craftspeople like Salvage Works, Bamboo Craftsman and Revive Upholstery and Design. We also have a lot of curators – vintage, antique and resale stores like Queens Mab, Kenton Antiques and Give and Take Resale. I don’t need to leave the district to get everything I need. Mo: Many of the business owners live, work and play within a 1-mile radius of the district. I really love having a business in Kenton. Every business is small and locally owned. It’s such a cool neighborhood and I can’t imagine having a business anywhere else in Portland. Salvage Works sells reclaimed lumber from deconstructed barns, houses and warehouses and produces tables, benches, shelves and doors. Their 25,000 square foot complex regularly hosts fundraisers and Kenton’s monthly Third Thursday Art and Music Showcase. Revive Upholstery and Design was founded by Leland Duck, who hails from an automotive background restoring classic cars. These days, Leland’s focus is on vintage furniture, working closely with clients to create unique, one of a kind pieces. Queens Mab (mother and baby) is a resale and gift boutique specializing in new and used children’s clothing, maternity clothing, women’s clothing, toys and accessories. How has Kenton’s identity changed over time? Mo: Kenton’s 4 block main street used to consist of about 10 bars and taverns and a handful of vacant storefronts. Many of my customers were born and raised in this area and they cannot believe how much the area has changed. The majority of the residents were employees of the meat packing company that used to be in the district so it really changed from an industrial focus to neighborhood serving. Michelle: It’s also 100% more pedestrian friendly than it used to be. When I moved here in 2003 we didn’t walk around much because there wasn’t really anything to walk to. Mo: Most of the current businesses in Kenton have opened within the last 7 years. Before that, there were a few anchor businesses like Cup and Saucer, Kenton Station, Mackin’s Auto Body and Kenton Antiques but it was not a walkable neighborhood. Michelle: When the City implemented a streetscape improvement project in downtown Kenton in 2009 there were some growing pains but it was worth it. The project’s completion brought much more foot traffic to the businesses that were starting to open in the district. Kenton Station is housed in the Kenton Hotel building built in 1909 by the Swift Meat Packing Company as a place where cattle buyers from the Midwest would meet with ranchers from Eastern Oregon. The hotel became famous for its basement speakeasy, boxing and tunnels connecting Kenton’s underground world. The History Channel also highlighted the frequent ghost sightings that have occurred in the building. Mackin’s Auto Body opened their first location on N Denver Ave in 1960. The building features a decommissioned chimney that is now a roost for thousands of migrating Vaux Swifts in the Spring and Fall months. 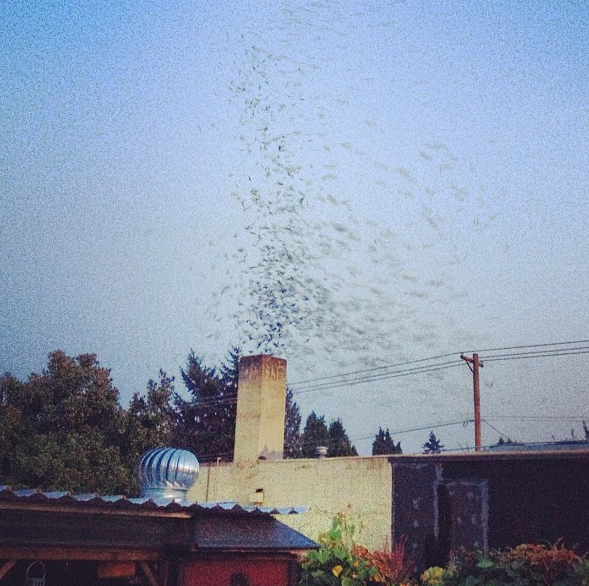 At dusk the birds return to the roost all at once in an impressive display. 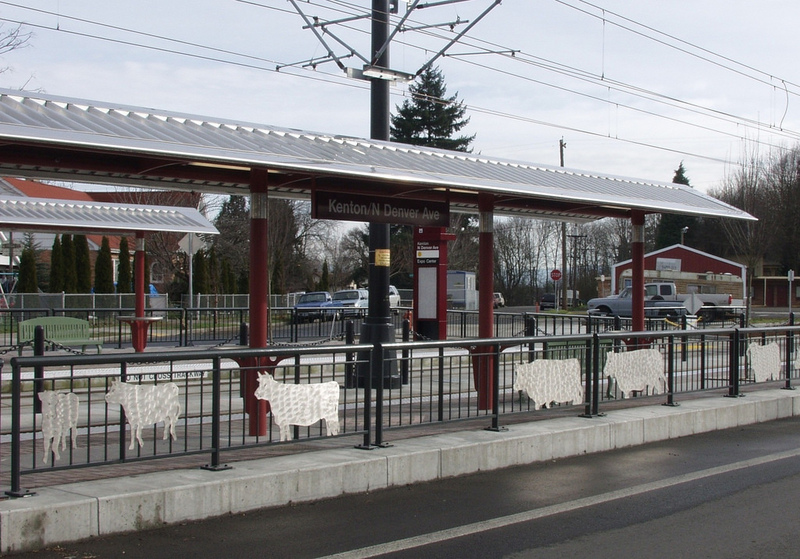 Trimet’s MAX Yellow Line opened in 2004 and provides Kenton residents and visitors with easy, car-free access to downtown Portland. The line stops at the intersection of N Denver Ave and N Interstate Ave and has resulted in an influx of new Kenton residents who were attracted by the convenient commute. Stops along the line feature public art that draw from the history and culture of the area. The Denver Avenue Streetscape Project brought significant improvements to Kenton’s downtown core including new, wider sidewalks with streetlights, street trees, stormwater planters, decorative pavers and bike racks. KBA also received an Economic Development grant from Venture Portland to reduce vacancies, help businesses purchase equipment and improve the interiors of businesses including Kenton Antiques and Triple Crown Food Market. These projects resulted in 18 new businesses opening in the district between 2010 and 2012 alone. In which ways has Kenton stayed the same? Mo: We’re very lucky to still be a diverse neighborhood with a solid mix of working class families. That helps to maintain Kenton’s small town charm. Michelle: We’re also really lucky with our geography in that our main street can’t really get any bigger like some other districts. Our boundaries help keep the community very close knit and not just a long strip of businesses. Kenton’s northern boundary includes Delta Park which occupies the former site of the city of Vanport. Originally built as housing for Kaiser shipyard workers, Vanport flooded in 1948 and was never rebuilt. The 86-acre park includes an off-leash dog area, a playground, sports fields and a street tree arboretum. The Columbia Slough flows through the southern portion of the park. The Slough was originally used by native peoples for fishing, hunting and safe canoe passage and is now home to over 175 species of birds. Green Zebra Grocery opened their first location in Kenton in 2013. Part convenience store, part health food store, Green Zebra provides Kenton residents with local, organic produce, sustainable seafood and of course, grass-fed beef. The local chain is quickly expanding and now has locations in the Lloyd District and Downtown Portland. What is your favorite time of year in Kenton? Michelle: I like the holidays. We put lights on the trees and people are out shopping. Also, I’m a big fan of sweater weather. Mo: I like the summer when I can get outside and go enjoy the sunshine. We have the Kenton Farmer’s Market and there’s lots of bars and restaurants with outdoor seating like Parkside and Swift and Union. Michelle: Summer is really fun too because there’s always people milling about. Especially during the Kenton Street Fair. Mo: This year we’re expecting to have about 80-100 vendors and a super awesome kid’s play area in the Wells Fargo Bank parking lot. There’s tons of food vendors including Pip’s Doughnuts which I am really excited about. There’s 3 live music stages with 30 bands and the fun continues into the night at The World Famous Kenton Club. Michelle: Don’t forget the coaster car race. Businesses and neighbors really get into it. There’s a rivalry between Figure Plant and Kenton Station that is not to be missed. The whole event kicks off with a children’s parade. This year’s theme is Paul Bunyan and Babe the Blue Ox. Rain or shine, don’t miss the Kenton Street Fair on May 15 from 10am-6pm in the heart of downtown Kenton on N Denver Ave between N Watts St and N Willis St. The Victorian Belle is a historic mansion in Kenton built in 1885. The house is said to be one of the first in Portland to have running hot and cold water, central heating, interior electricity and a windmill-powered water pump. During the month of December, the house is decorated with holiday lights and 10 different Christmas trees during ‘The Miracle of a Million Lights’. Swift and Union serves up seasonally inspired pub fare, craft cocktails and their famous sweet and salty bacon jam. The restaurant’s name is a reference to Kenton’s history as a former leader in the West Coast cattle trade. What would be the soundtrack for Kenton? Mo: Mostly trains and the Portland International Raceway (PIR). Since we’re a thoroughfare into Washington, we get an enormous amount of people passing through the district and around 100,000 of them are going to PIR. Michelle: PIR helps to promote Kenton and even pays for our tree lights during the holidays. Mo: I do like how we have those kinds of pastimes in the area – horse racing, car racing – they don’t really exist elsewhere in the city. Michelle: Some people might say that Kenton is a noisy place but we enjoy it. We can sit in our backyard and hear the announcer at PIR or the bell on the MAX train. If the wind is blowing the right way you can even hear boats on the river. PIR began hosting races in 1961 and now hosts 550 events per year including car racing, motocross, drag racing and bicycle racing. Their annual Winter Wonderland Holiday Light Show gives visitors the chance to enjoy 250 holiday lighting displays from the comfort of their own vehicle. 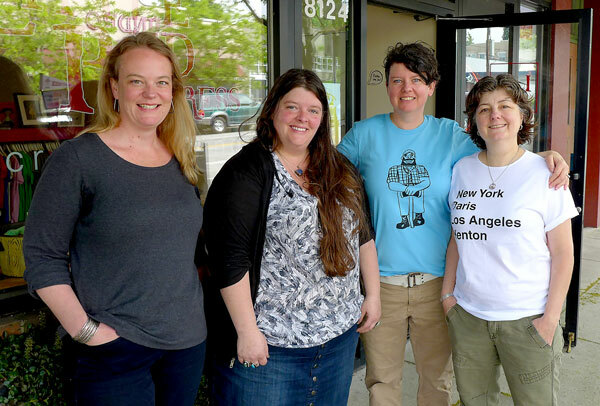 PIR generates an estimated 700 jobs in the area and regularly contributes to the North Portland Trust Fund, North Portland Tool Library and Kenton Concerts in the Park. Portland Meadows opened in 1946 and was the first horse track in the nation to offer nighttime racing. Over time the track has been damaged by flood and fire but still continues to host horse racing and other events such as their annual Kentucky Derby party and Poker Tournament. Other sounds in the district include live music hosted by The World Famous Kenton Club. The bar has been a Kenton institution since 1947 and gets its name from its role in the Raquel Welch film ‘Kansas City Bomber’. What would be your perfect day of food in Kenton? Mo: I’d have the Paul Bunyan for brunch at Swift and Union; it’s their biscuit and gravy with fried potatoes. Then I would probably grab a happy hour margarita at Fino, then over to Cultured Cavemen for their bacon-wrapped dates. For dinner, I would pick up some BBQ ribs from Cason’s Fine Meats. They will change your life forever in a way that is intangible to process. I cannot recommend them highly enough. Michelle: For breakfast I would have a bacon cheddar scone at Posies. I would have lunch at Parkside with one of their craft cocktails or I’d go to Po’Shines and get their hush puppies. For dinner, I’d take my family to Kenton Station and watch the Trailblazers game. Cultured Caveman began as a Kickstarter project in 2012 and quickly expanded to 3 food carts and a brick and mortar location in Kenton which is one of the country’s first fully paleo restaurants. 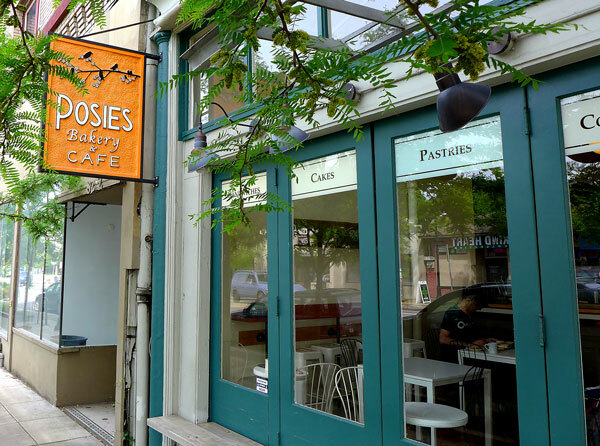 Posies Bakery and Café whips up cakes and cupcakes and also features a full café and kid-friendly play area. The café received it’s 15 minutes of fame in 2015 when it was featured on the TV show ‘Grimm’. Parkside is located across from Kenton Park and serves up craft cocktails and beer, a selective food menu and has lawn games available to borrow and use at the park. Po’Shines has been dishing up soul food since 1990 and provides job skills to underprivileged and disadvantaged youth. Mo: The Paul Bunyan statue. He is Kenton’s mascot. He’s a big draw for the district and many people come here just to see him. The Timbers put a scarf on him during the MLS championship and KBA put a Santa hat on him last December. We’re currently in the process of raising $50,000 to restore him to his former glory. A lot of people don’t realize that Bamboo Craftsman is in the neighborhood. That place is like a tiki oasis. They’ve got South Pacific décor, patio furniture, architectural stuff, things carved out of trees – it really is a beautiful space to walk around. Michelle: Plus, they have a tree house! That’s a hidden gem for sure. Also, Kenton Cycle Repair is off the beaten path but they are a family business that does a great job and they are very reasonably priced. Another hidden gem is Figure Plant. They do really neat design and fabrication work including window and store displays for Levi’s, Microsoft and Nike. They also help out with projects in the district like our metal banners and the Paul Bunyan Statute restoration project. Mo: Kind Heart Collective is also great. Some people were skeptical when they first announced they were moving to the district but they reached out to KBA when they got their commercial license and wanted to be involved with all that we do. Kenton’s 31 foot Paul Bunyan Statue was built in 1959 as part of Oregon’s Centennial celebrations. It was added to the National Register of Historic Places in 2009. The Kenton Business Association and the Kenton Neighborhood Association are currently in the process of raising funds for the statue’s restoration. To contribute visit paintpaulpdx.org. 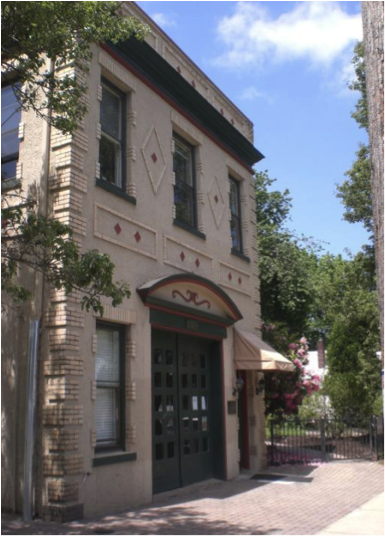 The Historic Kenton Firehouse was built in 1913 and serves as a community gathering space and venue for weddings, birthdays and memorials. The firehouse is also headquarters for North Portland Neighborhood Services, an organization that provides technical and financial assistance to 11 North Portland Neighborhoods. Other hidden gems in the district include Disjecta, an art center that provides exhibition space for artists curators and performers; Fang and Feather, a pet store supplying food, toys and accessories to Kenton’s pet owners and many urban chicken coops; Blue Ox Tattoo, home to some of Portland’s finest tattoo artists; Little Red Press, a boutique screen printing shop which produces T-shirts, prints, tote bags and assorted Kenton schwag and Sweet Science Boxing Gym, which has been hosting boxing classes and sparring matches since 2004. Michelle, as a longtime board member of KBA, what is your favorite Kenton accomplishment? 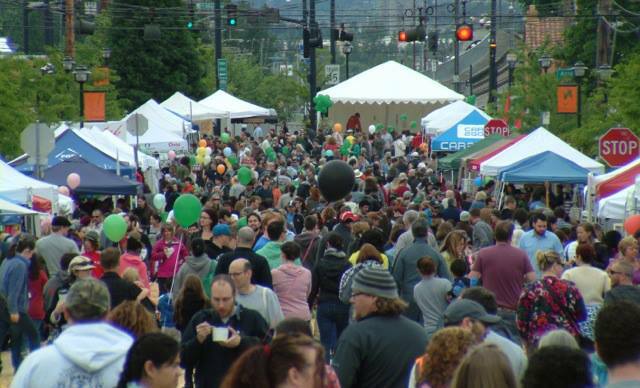 Michelle: I’m proud that the Kenton Street Fair has become self-sustaining. At one point our budget for the event was $6,000 and we needed more than half of that to be funded through grants. Now the budget is closer to $10,000 and KBA pays for it all. Mo: We might even make a small profit this year which will help fund our Holiday Tree Lighting and Wooden Nickel shopping promotion. Our entire calendar of events is self-sustaining and our membership is higher than it’s ever been. We have business owners from other districts attending our meetings because they want to get involved. Michelle: We also have more and more home-based businesses joining because they see opportunities to network and also contribute and give back to the community. We are lucky to have a great home based graphic designer named Marbry Walker who has graciously donated her services to help us with our posters, postcards and Facebook banners. Fun can be found in Kenton all year long with monthly Third Thursday Art and Music Events, the annual Kenton Street Fair in May, Trick or Treat in Kenton in October and Holiday Tree Lighting and Wooden Nickel shopping promotion in November and December. Kenton Farmer’s Market also sells fresh produce at N McClellan and N Denver on Wednesdays from 3-7pm (June-September). Mo, as KBA President, what future plans for the district are you most excited about? Mo: I’ve been really pleased to see some of our chronic long-term vacancies fill up in this past year. We had a lot of underutilized retail space in the district that is now home to thriving businesses and I hope that continues. 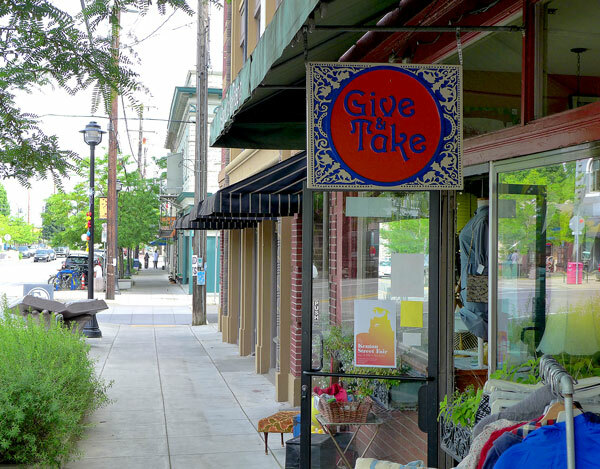 In fact, Integrate Architecture is currently in the process of restoring a historic storefront next to Posies and plans on sharing the space with a retailer from the neighborhood. Michelle: We partner with the Kenton Neighborhood Association on the neighborhood clean-up and the Paul Bunyan restoration project but I think we can do more. I would like us to partner with them on things like district garbage collection. I would love to have some cool garbage cans like you can find in other districts. Mo: I’m excited to work on improving Kenton’s infrastructure. During the holidays we have the sidewalk trees lit up and it really changes the dynamic of the district at night. I’m hoping in the next year or so the district will have permanent outdoor lighting. That would really help make the district even more ambient and friendly. If you don’t live in the neighborhood, Kenton is easily accessed via I-5, N Lombard St, the MAX Yellow Line (Kenton/N Denver Ave MAX Station) or the 4 Bus. Visit trimet.org for more information. Bicyclists can also access the district via bike lanes on N Interstate Ave or N Denver Ave.
Michelle, as the newly elected President of Venture Portland, how will you use your experiences with KBA to help support all 50 of Portland’s neighborhood business districts? Michelle: Over the years I’ve seen KBA grow from a small, emerging organization into a robust and diverse association that benefits both Kenton businesses and the local community. I hope to translate my experiences to support other emerging districts and help strengthen other districts through community and collaboration. Learn more about the district at kentonbusiness.com.